or the first time ever at World ATM Congress, a panel discussion didn’t include any air navigation service provider (ANSP) representatives, said Andrew Charlton, managing director, Aviation Advocacy, as he kicked off the 12 March “The Voice of UTM” panel. Unmanned aircraft systems (UAS) traffic management (UTM) helps use the world’s airspace more efficiently, panelists agreed. But the challenge is enabling communication between human-related air traffic management (ATM) and technology-related UTM. Charlton asked the panelists, who all represent the UTM industry, a series of challenging questions. What does an ANSP need to know to understand UTM? Todd Donovan, vice president of digital aviation, Thales, said controlled airspace is just a construct. So while ANSPs are well positioned to provide services for people who want to use airspace, “we need to rethink what services need to be provided where.” One way to accomplish that is to “do it, not just talk about it,” said Ben Marcus, chairman and cofounder, AirMap. Todd Donovan (far right) speaks at “The Voice of UTM” panel at the 2019 World ATM Congress. 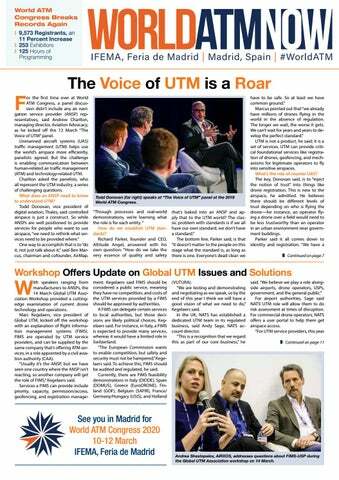 Andrea Shestopalov, AiRXOS, addresses questions about FIMS-USP during the Global UTM Association workshop on 14 March. Has Europe Learned the Lessons from Last Summer’s ATM Crisis? Last summer’s ATM capacity and staff shortage was a wakeup call for European aviation, said Henrik Hololei, director-general for mobility and transport, European Commission, during the 12 March keynote session. “What is the saying: ‘Never waste a good crisis?’” he said. “This must not become the new normal.” In a wide-ranging speech and follow-up discussion with Jeff Poole, director general, Civil Air Navigation Services Organisation (CANSO), Hololei outlined the steps he believes are necessary to manage the phenomenal air traffic growth in Europe and worldwide. Last year, for the first time ever, Hololei said the European network served more than 11 million flights. Global air traffic is also expected to double over the next 15 years, and that brings serious challenges, he said. First of all, there is geopolitical instability due to Brexit and potential trade wars, Hololei said. “Aviation is the business of freedom, but current global trends are challenging this.” Over the years, aviation has proven remarkably resilient to economic shocks, but that was during a time of open markets with liberal economic policies, he said. Hololei outlined four other major challenges that aviation growth will bring: •	Maintaining high safety and security standards. Emma Parry, NATS, and Milena Bowman, EUROCONTROL, chat about attracting millennials to the ATM workforce. agencies gave her the specialised training courses she needed to succeed in the acquisition field. But as she moved into the technical side of the industry, she found management suited her. “I thought I could do a better job than the managers I worked for,” who were all men. Only the use of the respective systems can expand the airspace capacities, which are necessary to manage the growing number of flight movements. Where once analogue techniques were deployed, now data centres are used to provide us with all necessary information. Therefore, an optimal system control is indispensable. Because installations have to be operated, administrated and properly protected in times of cyber security – and they should also provide reliable redundancies. Talk to the KVM ATC expert from G&D about your best possible IT infrastructure. The audience attentively listens to a panel discussing how four continents best utilize ATM capacity. ▲ iTEC Members (including PANSA) and EUROCONTROL signed a Flight Object Interoperability Collaboration Agreement which continues the joint developments of the iTEC Group of ANSPs and system suppliers towards cutting-edge ATM solutions. Frank Köhne, managing director of Harris, and Kevin Shum, directorgeneral of CAAS, at a 12 March signing ceremony for the Singapore AMAN/ DMAN System Contract. ▲ Geert-Jan Beckman, ITMS, and Heinz-Michael Kraft, GroupEAD, shake hands at the GroupEAD Stand. ▲ On 13 March, a ceremony took place between Airbus Engineering—represented by Jean-Brice Dumont, EVP Engineering – and a delegation from the Chinese ATM solutions supplier CETC, to mark the cooperation for validating a new CETCdeveloped Ground Based Augmentation System (GBAS) ground station. edge is power, and it gives you the freedom to soar,” Waiz said. “It gives girls a village to support them in their educational endeavors.” In 2017, in an effort to reach girls globally, Waiz became the youngest woman to fly solo around the world in a single-engine aircraft. She piloted a Beechcraft Bonanza to 22 countries, teaching STEM and aviation concepts to 3,000 children along the way. Since then, Waiz has collaborated with over 30 STEM organisations, reaching another 8.000 children around the globe. “My message to kids everywhere is that they can dream and soar their way out of any situation,” she said. SKY UNDER CONTROL Being able to understand our clients needs and deliver solutions to leverage the efficiency and safety of their operations is our greatest inspiration. Meet Atech complete business solutions. Contact us. FLIGHTS, FROM TAKEOFF TO LANDING. MEET MAKRON ON WATM 2019, STAND 911.
balance, flex time, and the opportunity to try new things in their careers. Social media is an important millennial communication tool, she said, and members of this generation want to “make the gap shorter” between entrylevel jobs and executive roles. They also want to communicate regularly with leadership. “It helps us feel valued and like we have a place,” she said. Bowman said young professionals raised on Snapchat and Instagram “need feedback in a nanosecond.” They use shorter words and a lot of emojis, so older coworkers may have to adjust their language to communicate with them. They also don’t want procedures detailed in a book or manual, but rather an app or a graphic. It’s important that older supervisors recognise that many millennials manage dual careers, Bowman said. Both she and her husband work in ATM, but her husband opted to work part time in order to care for their children. “We get a lot of questions and bias about that choice,” she said. “Millennials have shared responsibility for raising a family, and leaders need to adjust to that. Connectivity and technology allow us to work remotely and have flexible working times. And that enables all kinds of people to pursue a career.” Another key characteristic of millennials is that they’re not necessarily looking for a “job for life,” Parry said. But this can create issues for air traffic controllers because of the need for extensive training. Bristol said the FAA is dealing with this by using technology to expedite training time. The enroute center near Washington, D.C., can train a controller in about 26 months, she said. Controllers can also move within their organisations, going to security, tech ops, or management jobs. “The investment in their training pays dividends in the work they can do in other functions,” Bristol said. Be part of the future of air traffic management With CANSO’s members supporting almost 90 per cent of world air traffic, half-page CANSOad CANSO is the global voice of air traffic management (ATM). Join today to help shape the future of a safe, efficient and seamless airspace. connect to a central UTM system. Should drone operators be licensed? Licensing offers additional scrutiny, Donovan said, but manufacturers’ fundamental belief is that licensing shouldn’t be overly burdensome for the operator. He believes there need to be varying degrees of licensing depending on how and where a drone is operating. This also applies to operator training levels, Kegelaers said. “The reality is that in 10 years from now we’re not going to be having one pilot flying a drone,” Marcus added. Instead, there will be operations flying multiple drones, with limited human involvement. tentially threatening drone. The UTM system is an advanced version of the ATC system Phoenix, a DFS in-house development which can process position data from a range of sources. Drones equipped with a special LTE transponder connect to the mobile network and transmit their position to the UTM. The UTM system then displays the air situation, shows surrounding traffic, and warns of potential conflicts. The project has received much attention in Germany and was awarded the German Mobility Prize 2018. Join our more than 1,000 members from 150+ countries representing all facets of aviation. Beneﬁts include: • Global Safety Information Project (GSIP) – FSF is pushing the industry toward more collaborative data sharing arrangements and making the most eﬀective risk mitigation plans. Our GSIP toolkits describe current best practices and some that may be on the horizon; • Subscriptions to AeroSafety World – our members-only monthly magazine featuring safety-forward information; • Discounts to FSF’s premier annual safety summits; • ...and more. IHSE KVM SOLUTIONS deliver secure data transmission throughout the entire air traffic control and management process. Instant access to any ATM device enhances safety and operational efficiency for 24/7 operation from take-off to landing – and beyond. manned systems, such as self-piloted air taxis.“ From Dumont: “Implementing a UTM system is an iterative process. LAANC is the first step, and it is the logical place to start. The aviation industry is very slow by design at implementing new technology. We have to define the mission and requirements first or we’ll never get there. That will dictate what we do and how we do it. With UTM, we will get there—maybe not as fast as we’d like, because we’re being pushed by the speed of technology and constrained by the speed of regulation, but I believe we’ll get there – we have to so that our industry can evolve.” Peter Dumont, ATCA, and Dr. Isabel Del Pozo de Poza, Airbus UTM, chat about Defining Future Skies: The Evolution of ATM and UTM. ❚ Read the full article in the next issue of the ATCA Bulletin, a membersonly benefit. Learn more about becoming an ATCA member at www.atca.org/ membership. research and deployment. On March 12, the Europe For Aviation theatre proved an ideal location for the European Commission to host the Single European Sky Awards 2019. Click here for the winners. 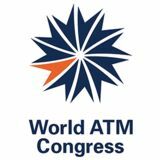 Keep an eye on all Europe For Aviation organisations’ websites for World ATM Congress 2020. Preparations are already underway. Stay tuned for the latest developments and follow #Europe ForAviation on social media. we hope to be the first to open our network to open APIs to use whatever platform they want,” he said. “For the general public, we’re committed to spending some of our safety budget to provide information to hobbyist users. We believe we can play a key role in enabling trust in drone use.“ In addition to outlining NATS’ UTM principles, Sage said NATS has launched an online training module for hobbyists, published UK flight restriction zones at dronesafe.uk, created safety cases for specific categoAndy Sage talks about FIMS-USP during the Global UTM Association workshop. require constant human monitoring and surveillance, Ganjoo added. It should also allow full audit capability. He also discussed the potential role of a FIMS. The system could handle registration and licensing; identity and authentication for providers; controlled airspace notification and authorisation; data exchange between manned and unmanned aircraft; constraint management; an emphasis on open, federated ecosystem approaches; airspace definitions, restrictions, and no-fly zones; interANSP data exchange; and fair use of airspace. Attendees listen to Andy Sage talk about FIMS-USP during the Global UTM Association workshop on 14 March. Photo courtesy of NATCA ZTL. ries of operation in different types of airspace, and launched Operation Zenith in partnership with Altitude Angel and Manchester Airport. Rupert Benbrook, Altitude Angel, provided more details on Operation Zenith, which began in November 2018 and includes a drone operational position in the Manchester Airport tower. Operation Zenith covers a variety of UTM scenarios, including on-airfield delivery, runway threshold inspection, beyond visual line-ofsight linear infrastructure inspection, atmospheric survey (VLOS), commercial VLOS operation, VLOS site survey, safeguarding, and airspace management. ATCA membership keeps you on the forefront of the industry and moving forward in your career. With a full cadre of events and award-winning publications, we connect the world of air traffic management. Won’t you join us?